Enter Code WEST15 at checkout to apply discount. Offer is valid on case quantities of emergency food bars and cases of emergency water only. 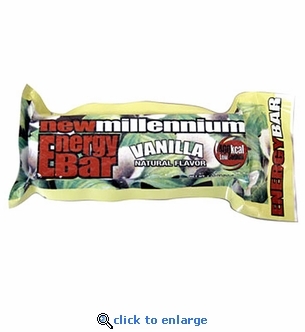 This case of 144 Vanilla New Millennium Energy Bars are great for emergency and survival kits for homes and business. Includes 144 individually wrapped 400 calorie energy bars that have a 5-year shelf life and are U.S. Coast Guard approved. Be prepared on outdoor adventures by having these emergency food bars with you when hiking, camping, hunting, and more. Low sodium content keeps you less thirsty. Also available in Apricot, Lemon, Cherry, Blueberry, Coconut, Tropical Fruit, Raspberry and Orange. Ingredients: Sugar, Vegetable Shortening (Partially Hydrogenated Soybean & Cottonseed Oils), Enriched Bromated Flour Bleached (Wheat Flour, Enzymes, Niacin, Reduced Iron, Potassium Bromate, Thiamin Mononitrate, Riboflavin, Folic Acid), Cornstarch, Wheat Gluten, Dextrose, Desiccated Coconut, Corn Syrup, Contains 2% or less of each of the following: Soy Lecithin, Natural & Artificial Flavor, Guar Gum, Calcium Propionate (Preservative), Citrus Acid, Salt, Ascorbic Acid, Ascorbyl Palmitate, Niacin, Vitamin A, Palmitate, Riboflavin, Thiamin Mononitrate.